Airline passenger Stefanie Gordon used an iPhone to snap this photo of the space shuttle Endeavour streaking toward space on May 16. Gordon was flying from New York to Palm Beach, Fla., aboard a Delta jet. CAPE CANAVERAL, Fla. — Spectators on the ground got a stunted view of space shuttle Endeavour's final launch Monday (May 16) when it vanished into a ceiling of clouds shortly after liftoff. However, some lucky passengers who happened to be in the air at the time saw the fantastic sight of the shuttle streaking its way to orbit. "My plane flew right past the shuttle!" she posted on Twitter, along with the photos, under the name @Stefmara. 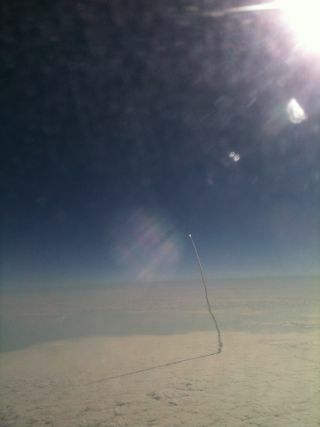 Another photo of Endeavour's May 16 launch, taken out an airplane window by passenger Stefanie Gordon. Now Gordon has gained international attention and picked up more than 1,000 new followers. "All I was doing was coming to Florida for my mom's birthday!!!" she tweeted. All in all, Gordon said she was glad she didn't completely sleep through the flight. Endeavour is chasing down the International Space Station, where it will spend about two weeks delivering a dark matter-hunting experiment and a load of spare parts to the orbiting laboratory. Yesterday's launch was the last one for Endeavour, which will retire to the California Museum of Science after this mission. Its sister orbiters, Discovery and Atlantis, will also be retired after NASA's final space shuttle mission in July.